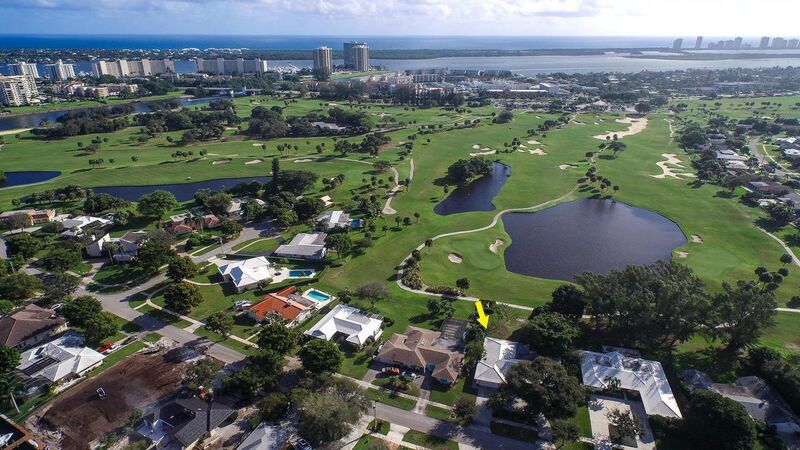 Rarely available 4 bedroom 2 and 1/2 bath Country Club Drive home, with incredible golf course and lake views up the 16th, 17th, and 18th holes, in the Village of North Palm Beach! Beyond the formal foyer, an expansive living room and dining room area overlooks one of the most impressive views in the entire neighborhood. This split-floor plan features a large Master suite with walk-in closet and en-suite bath , two additional bedrooms, and a fourth office/bedroom. The spacious kitchen features a pass-through to the patio, an eat-in area, and leads to the den. Watch the sun rise or 4th of July fireworks over the golf course and lake from the large, covered patio. Large laundry/mud room and abundant storage throughout. Circular driveway leads to an oversized 2-car garage.